Trauma is the leading cause of death in young adults and acute blood loss contributes to a large portion of mortality in the early post-trauma period. The recognition of lethal triad of coagulopathy, hypothermia and acidosis has led to the concepts of damage control surgery and resuscitation. Recent experience with managing polytrauma victims from the Iraq and Afghanistan wars has led to a few significant changes in clinical practice. Simultaneously, transfusion practices in the civilian settings have also been extensively studied retrospectively and prospectively in the last decade. Early treatment of coagulopathy with a high ratio of fresh frozen plasma and platelets to packed red blood cells (FFP:platelet:RBC), prevention and early correction of hypothermia and acidosis, monitoring of hemostasis using point of care tests like thromoboelastometry, use of recombinant activated factor VII, antifibrinolytic drugs like tranexamic acid are just some of the emerging trends. Further studies, especially in the civilian trauma centers, are needed to confirm the lessons learned in the military environment. Identification of patients likely to need massive transfusion followed by immediate preventive and therapeutic interventions to prevent the development of coagulopathy could help in reducing the morbidity and mortality associated with uncontrolled hemorrhage in trauma patients. An estimated 5 million people worldwide died from injuries in 2000 - a mortality rate of 83.7 per 100,000 population. The World Health Organization (WHO) estimates that the burden of disease related to injuries, particularly road traffic injuries, interpersonal violence, war and self-inflicted injuries is expected to rise dramatically by the year 2020. Trauma is the leading cause of death in all ages from 1 to 44 years. Up to 40% of polytrauma patients die as a result of circulatory shock from acute blood loss. Besides surgical control of hemorrhage, adequate volume resuscitation with blood products and fluids is crucial for the survival of these victims. In this article, we review the trends in transfusion practices in trauma patients. The basis of RBC transfusion is to augment the oxygen delivery to tissues. The guidelines from Advanced Trauma Life Support (ATLS) suggest that in patients with hypovolemic shock, failure to restore normal vital signs after infusion of 40-60 mL/kg of crystalloids should trigger the need for transfusion of blood products. Where laboratory tests are available, clinicians have traditionally used a hemoblogin (Hb) level of 10 g% or a hematocrit (Hct) of 30% as the lowest acceptable level. Several other physiologic measures such as mixed venous oxygen saturation, oxygen extraction ratio,  near infra-red spectroscopic estimation of regional cerebral oxyhemoglobin concentration, and brain tissue oxygenation  have been suggested as potential transfusion triggers in polytrauma. Recently, survival has been reported in a patient with Hb level of 0.7 g% (Hct 2.2%). The risks of allogenic blood transfusion with all the attendant risks should be carefully balanced with the benefits of optimizing oxygen delivery to the tissues. Blood transfusion is an independent risk factor for infection and increased resource utilization in combat trauma. One should exercise caution in allowing the Hb level to drop below 6 g%, especially in the presence of ongoing blood loss and coagulopathy. Recent guidelines for perioperative transfusion from the American Society of Anesthesiologists,  and for trauma transfusion from the UK and Europe are excellent resources , for further reading on this topic. Massive transfusion (MT) refers to the transfusion of 10 or more RBC products in 24 hours or to replacement of one or more RBC blood volumes in pediatric patients. , When there is no time to do blood typing and crossmatching, group O RBCs and AB plasma products should be used till the patient's blood type is known. Women of child bearing potential should receive group O, D-negative RBCs till type-specific and cross-matched blood is available. [Table 1] shows the approximate times required for the various products at our level I trauma center. Institutions that handle polytrauma patients must have their own MT protocol (MTP) that is developed by trauma team and blood bank services. [Table 2] shows one such protocol. MT using preset packages of various blood components in a predetermined sequence is commonly used till the laboratory tests can guide further transfusion. These transfusion packs and the protocols help to reduce the delay in ordering, preparing and transfusing the products and also to reduce the amount of crystalloids infused and thus reduce the dilutional coagulopathy. [Figure 1] shows the conventional triggers for administration of various fluids and blood products based on laboratory testing. Thus far, prothrombin time (PT) and activated partial thromboplastin time (aPTT) have been used to guide the need for procoagulant factor administration during blood transfusion. However, these in vitro tests are not reliable in the rapidly changing hemostatic circumstances where hemodilution, consumption, hypothermia, and acidosis constantly alter the levels and functioning of clotting factors. Also, these tests cannot provide information on the platelet function. Thromboelastography (TEG), which can quantify initiation of clotting, propagation kinetics, fibrin-platelet interactions, clot strength and fibrinolysis may be a more suitable test in the hemorrhaging trauma victim. The benefits of goal-directed transfusion therapy by real-time assessment of coagulation function via point of care rapid thromboelastography and rotational thromboelastometry (ROTEM) are being reported by several investigators. ,, [Figure 2] shows the development of acute endogenous coagulopathy of trauma which progressively becomes worse with dilution and consumption of procoagulant factors, acidosis and, hypothermia. 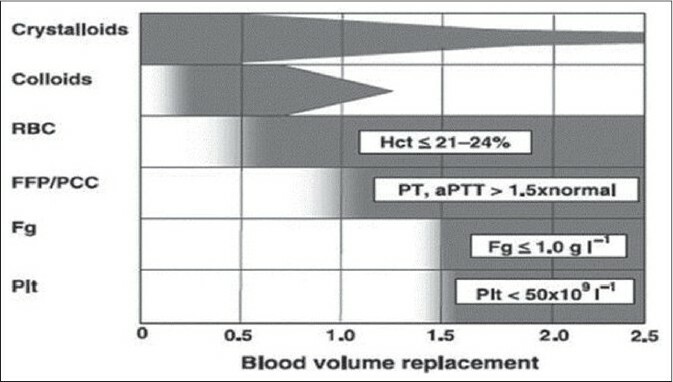 [Figure 3] and [Figure 4] show the principle/technique of TEG, the normal thrombolestogram and the impact of various types of coagulation abnormalities on the thromboelastogram. In a retrospective study comparing trauma surgical patients who received intraoperative cell salvage versus those who did not, Brown et al. reported that intraoperative use of cell saver reduces the need for allogenic blood products and results in reduced cost. Most relevant contraindication for the use of cell saver is the contamination of collected blood by other body fluids such as gut contents. These include hypothermia, acid/base derangements, electrolyte abnormalities such as hypocalcemia, hypo/hyperkalemia, citrate toxicity, and transfusion-associated acute lung injury. Transfusion of blood products in trauma has been identified as an independent predictor of multiple organ failure,  acute respiratory distress syndrome (ARDS), increased infection, and increased mortality in many studies. Once definitive control of hemorrhage has been established, a restrictive approach to blood transfusion should be implemented to minimize additional morbidity/mortality. Current available evidence suggests that only massively transfused patients could potentially benefit from a higher FFP:RBC ratio. Increased transfusion of FFP to non-massively transfused patients would be potentially wasteful, probably provides no survival benefit, and is potentially dangerous as plasma transfusion can cause complications. Transfusion related acute lung injury (TRALI) is currently the leading cause of transfusion-related death in the United States. Patients receiving higher FFP:PRBC ratio have been observed to have a twofold higher incidence of ARDS in massive  and other trauma transfusions. Resource utilization issues associated with more aggressive use of FFP and platelets in MT should always be considered when using a high FFP ratio. The preparation and storage of plasma and platelets are expensive. Group AB plasma is scarce, and maintaining a supply of pre-thawed AB plasma that is readily available for MT is both expensive and a huge burden on the blood bank. Hemorrhage and subsequent hemodilution during fluid resuscitation induce complex hemostatic changes to the coagulation and fibrinolysis pathways, the end result of which is a coagulopathy of trauma. This is worsened by hypothermia and acidosis, which often accompany polytrauma. The ideal ratio between PRBCs, FFP and platelet transfusion is still under investigation. There is some evidence that use of PRBCs:FFP:platelets in the 1:1:1 ratio helps control hemorrhage, reduces coagulopathy, and improves survival. However, this ratio has been challenged by studies which have found the optimal ratio of plasma to be in the 1:2-1:3 range. Providers caring for trauma victims should differentiate between hemorrhage requiring MT and one that does not, as these are entirely different physiologic states, especially with respect to coagulation profiles. Routine use of thromoboelastometry to guide the transfusion of procoagulant blood components may optimize the utilization of blood components. The use of tranexamic acid and rFVII (after correction of acidosis, fibrinogen levels and platelet count) should be considered in cases of uncontrolled hemorrhage following trauma. 1. Peden MK, McGee, Sharma G. The injury chart book: A graphical overview of the global burden of injuries. 2002; Available from: http://whqlibdoc.who.int/publications/924156220x.pdf. 2. Thomas D, Wee M, Clyburn P, Walker I, Brohi K, Collins P, et al. Blood transfusion and the anaesthetist: Management of massive haemorrhage. Anaesthesia 2010;65:1153-61. 3. Keel M, Trentz o. Pathophysiology of polytrauma. Injury 2005;36:691-709. 4. Sehgal LR, Zebala LP, Takagi I, Curran RD, Votapka TV, Caprini JA. Evaluation of oxygen extraction ratio as a physiologic transfusion trigger in coronary artery bypass graft surgery patients. Transfusion 2001;41:591-5. 5. Sharma D, Vavilala MS. Should brain tissue oxygenation be the transfusion trigger in traumatic brain injury? Pediatr Crit Care Med 2010;11:420-1. 6. Dai J, Tu W, Yang Z, Lin R. Case report: Intraoperative management of extreme hemodilution in a patient with a severed axillary artery. Anesth Analg 2010;111:1204-6. 7. Dunne JR, Riddle MS, Danko J, Hayden R, Petersen K. Blood transfusion is associated with infection and increased resource utilization in combat casualties. Am Surg 2006;72:619-25; discussion 625-6. 8. Practice guidelines for perioperative blood transfusion and adjuvant therapies: An updated report by the American Society of Anesthesiologists Task Force on Perioperative Blood Transfusion and Adjuvant Therapies. Anesthesiology 2006;105:198-208. 9. Rossaint R, Bouillon B, Cerny V, Coats TJ, Duranteau J, Fernández-Mondéjar E, et al Management of bleeding following major trauma: An updated European guideline. Crit Care 2010;14:R52. 10. Holcomb JB, Wade CE, Michalek JE, Chisholm GB, Zarzabal LA, Schreiber MA, et al. Increased plasma and platelet to red blood cell ratios improves outcome in 466 massively transfused civilian trauma patients. Ann Surg 2008;248:447-58. 11. Sihler KC, Napolitano LM. Massive transfusion: New insights. Chest 2009;136:1654-67. 12. Shaz BH, Dente CJ, Harris RS, MacLeod JB, Hillyer CD. Transfusion management of trauma patients. Anesth Analg 2009;108:1760-8. 13. Brohi K, Cohen MJ, Davenport RA. 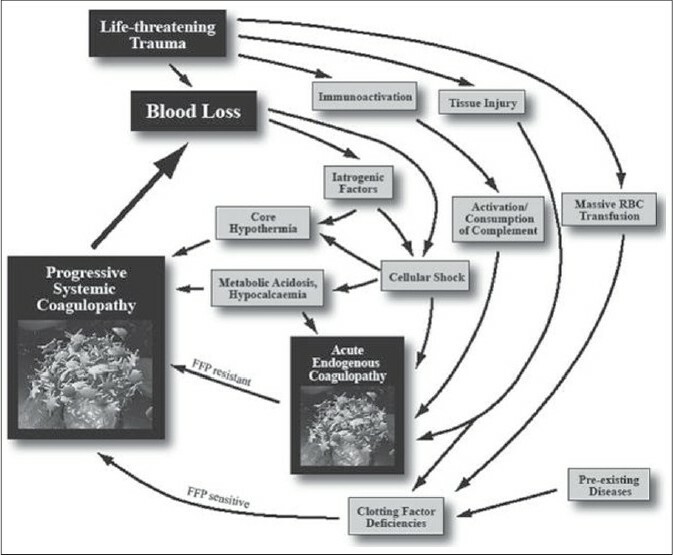 Acute coagulopathy of trauma: Mechanism, identification and effect. Curr Opin Crit Care 2007;13:680-5. 14. Yuan S, Ferrell C, Chandler WL. Comparing the prothrombin time INR versus the APTT to evaluate the coagulopathy of acute trauma. Thromb Res 2007;120:29-37. 15. Bolliger D, Görlinger K, Tanaka KA. Tanaka, Pathophysiology and treatment of coagulopathy in massive hemorrhage and hemodilution. Anesthesiology 2010;113:1205-19. 16. Rugeri L, Levrat A, David JS, Delecroix E, Floccard B, Gros A, et al. Diagnosis of early coagulation abnormalities in trauma patients by rotation thrombelastography. J Thromb Haemost 2007;5:289-95. 17. Kashuk JL, Moore EE, Sawyer M, Le T, Johnson J, Biffl WL, et al. Postinjury coagulopathy management: Goal directed resuscitation via POC thrombelastography. Ann Surg 2010;251:604-14. 18. Schöchl H, Nienaber U, Hofer G, Voelckel W, Jambor C, Scharbert G, et al. 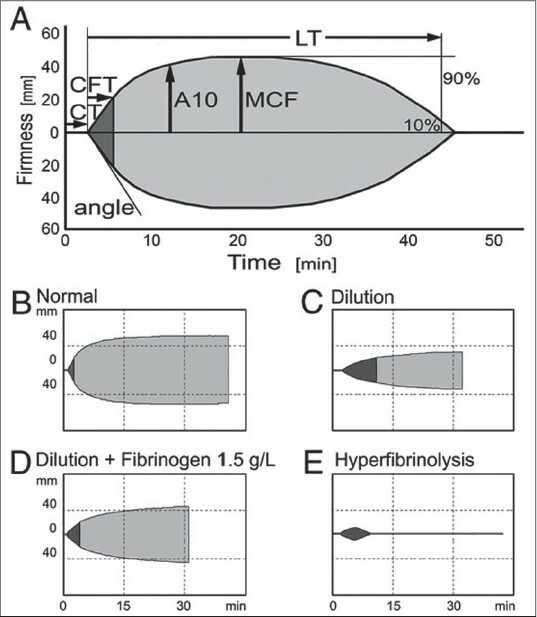 Goal-directed coagulation management of major trauma patients using thromboelastometry (ROTEM)-guided administration of fibrinogen concentrate and prothrombin complex concentrate. Crit Care 2010;14:R55. 19. Brenni M, Worn M, Brüesch M, Spahn DR, Ganter MT. Successful rotational thromboelastometry-guided treatment of traumatic haemorrhage, hyperfibrinolysis and coagulopathy. Acta Anaesthesiol Scand 2010;54:111-7. 20. Duchesne JC, McSwain NE Jr, Cotton BA, Hunt JP, Dellavolpe J, Lafaro K, et al. Damage control resuscitation: The new face of damage control. J Trauma 2010;69:976-90. 21. Holcomb JB, Jenkins D, Rhee P, Johannigman J, Mahoney P, Mehta S, et al. Damage control resuscitation: Directly addressing the early coagulopathy of trauma. J Trauma 2007;62:307-10. 22. Duchesne JC, Kimonis K, Marr AB, Rennie KV, Wahl G, Wells JE, et al. Damage control resuscitation in combination with damage control laparotomy: A survival advantage. J Trauma 2010;69:46-52. 23. Brown CV, Foulkrod KH, Sadler HT, Richards EK, Biggan DP, Czysz C, et al. Autologous blood transfusion during emergency trauma operations. Arch Surg 2010;145:690-4. 24. Borgman MA, Spinella PC, Perkins JG, Grathwohl KW, Repine T, Beekley AC, et al. The ratio of blood products transfused affects mortality in patients receiving massive transfusions at a combat support hospital. J Trauma 2007;63:805-13. 25. Kashuk JL, Moore EE, Johnson JL, Haenel J, Wilson M, Moore JB, et al. Postinjury life threatening coagulopathy: Is 1:1 fresh frozen plasma:packed red blood cells the answer? J Trauma 2008;65:261-70; discussion 270-1. 26. Murad MH, Stubbs JR, Gandhi MJ, Wang AT, Paul A, Erwin PJ, et al. The effect of plasma transfusion on morbidity and mortality: A systematic review and meta-analysis. Transfusion 2010;50:1370-83. 27. Schuster KM, Davis KA, Lui FY, Maerz LL, Kaplan LJ. The status of massive transfusion protocols in United States trauma centers: Massive transfusion or massive confusion? Transfusion 2010;50:1545-51. 28. Inaba K, Lustenberger T, Rhee P, Holcomb JB, Blackbourne LH, Shulman I, et al. The Impact of Platelet Transfusion in Massively Transfused Trauma Patients. J Am Coll Surg 2010;211:573-9. 29. Perkins JG, Cap AP, Spinella PC, Shorr AF, Beekley AC, Grathwohl KW, et al. Comparison of platelet transfusion as fresh whole blood versus apheresis platelets for massively transfused combat trauma patients. Transfusion 2011;51:242-252. 30. Spahn DR, Cerny V, Coats TJ, Duranteau J, Fernández-Mondéjar E, Gordini G, et al. Management of bleeding following major trauma: A European guideline. Crit Care 2007;11: R17. 31. Rizoli SB, Nascimento B Jr, Osman F, Netto FS, Kiss A, Callum J, et al. Recombinant activated coagulation factor VII and bleeding trauma patients. J Trauma 2006;61:1419-25. 32. Spinella PC, Perkins JG, McLaughlin DF, Niles SE, Grathwohl KW, Beekley AC, et al. The effect of recombinant activated factor VII on mortality in combat-related casualties with severe trauma and massive transfusion. J Trauma 2008;64:286-93; discussion 293-4. 33. Boffard KD, Riou B, Warren B, Choong PI, Rizoli S, Rossaint R, et al. Recombinant factor VIIa as adjunctive therapy for bleeding control in severely injured trauma patients: Two parallel randomized, placebo-controlled, double-blind clinical trials. J Trauma 2005;59:8-15; discussion 15-8. 34. Bolliger D, Szlam F, Levy JH, Molinaro RJ, Tanaka KA. Haemodilution-induced profibrinolytic state is mitigated by fresh-frozen plasma: Implications for early haemostatic intervention in massive haemorrhage. Br J Anaesth 2010;104:318-25. 35. Shakur H, Roberts I, Bautista R, Caballero J, Coats T, Dewan Y, et al. Effects of tranexamic acid on death, vascular occlusive events, and blood transfusion in trauma patients with significant haemorrhage (CRASH-2): A randomised, placebo-controlled trial. Lancet 2010;376:23-32. 36. Cotton BA, Dossett LA, Haut ER, Shafi S, Nunez TC, Au BK, et al. Multicenter validation of a simplified score to predict massive transfusion in trauma. J Trauma 2010;69:S33-9. 37. Sihler KC, Napolitano LM. Complications of massive transfusion. Chest 2010;137:209-20. 38. Johnson JL, Moore EE, Kashuk JL, Banerjee A, Cothren CC, Biffl WL, et al. Effect of blood products transfusion on the development of postinjury multiple organ failure. Arch Surg 2010;145:973-7. 39. Inaba K, Branco BC, Rhee P, Holcomb JB, Blackbourne LH, Shulman I, et al. Impact of ABO-identical vs ABO-compatible nonidentical plasma transfusion in trauma patients. Arch Surg 2010;145:899-906. 40. Phan HH, Wisner DH. Should we increase the ratio of plasma/platelets to red blood cells in massive transfusion: What is the evidence? Vox Sang 2010;98:395-402. 41. Triulzi DJ. Transfusion-related acute lung injury: Current concepts for the clinician. Anesth Analg 2009;108:770-6. 42. Sperry JL, Ochoa JB, Gunn SR, Alarcon LH, Minei JP, Cuschieri J, et al. An FFP:PRBC transfusion ratio >/=1:1.5 is associated with a lower risk of mortality after massive transfusion. J Trauma 2008;65:986-93. 43. Watson GA, Sperry JL, Rosengart MR, Minei JP, Harbrecht BG, Moore EE, et al. Fresh frozen plasma is independently associated with a higher risk of multiple organ failure and acute respiratory distress syndrome. J Trauma 2009;67:221-7; discussion 228-30.